Big news from the weekend was the third ascent of Anubis (XII,12) on Ben Nevis by Greg Boswell. The first winter ascent of this overhanging summer E8 on The Comb was made by Dave MacLeod in February 2010. It is widely regarded as the most difficult winter route on Ben Nevis, and along with Greg’s route Banana Wall in the Northern Corries, it is the only route in Scotland that merits a Grade XII rating. The heavy snowfall at the beginning of the week turned Ben Nevis as white as a Christmas cake, and Greg was quick to take the rare opportunity to attempt this severely overhanging line when it was completely frosted. 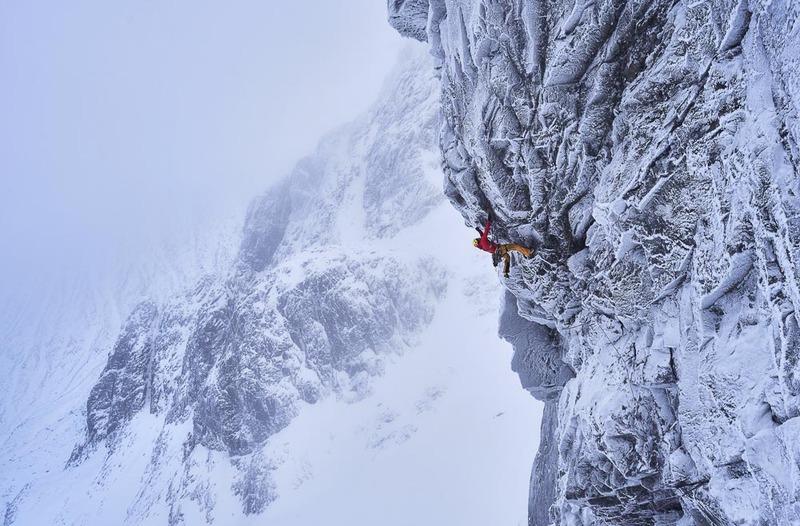 Greg tried the route with Helen Rennard on January 30 and then returned three days later to make his successful ascent with Robbie Phillips on February 2. “I had gone for the on sight earlier in the week on Wednesday,” Greg told me. “But after taking my time to figure out the hard moves leaving the ground, I fell off mid-way up the steep corner-crack over the bulge. The terrain above me looked super hard and intimidating, so even though I had another go that day, my head and arms weren’t up to the task. I fell just above me previous high point and decided to take my gear out and vowed not to let it get the better of me. A big thanks to Helen Rennard for the belay and support. Returning on Saturday with Robbie Phillips, I was ready for a fight! I swiftly got to the point I reached on my first attempt, but I nearly blew it when a thin axe placement ripped on the steep ground, shock loading me into one arm. I composed myself again and managed to make some upward progress. After the bulge, the steepness died off a little, but the placements got so bad! I found myself way above my gear, hooking a tiny sloping edge with very poor and unbalanced footholds. This is when I had to have a stern word with myself! I struggled to make any upward moves as there were no ‘usable’ placements to be found. I dropped a sling over a dodgy looking spike of rock and managed to get a couple of other very suspect looking backups placed, all whilst trying not to move my axe pick a mm to either side, through fear of it blowing off. I now had no choice but to continue. After what felt like an age, I committed to a series of moves that were on some of the poorest holds I’ve ever used, knowing full well I wouldn’t be able to reverse any of them. As one axe ripped, the other happened to stick on a round sloper and I was able to do a ‘big heart in mouth’ cross through to an awkward torque in the baggy crack. ‘Breathe… just breathe,’ I thought. It wasn’t long before I was below the overhanging corner, but now I was happy. There was another big roof above and still some very technical and hard climbing to do, but eventually I managed to mantle onto the snowy ledge at the top of the pitch and feel the overwhelming sensation of achievement hit me like a train. Robbie seconded the pitch and then I led the remaining 230m of Grade V and III ground to the plateau, where we sat and watched the most beautiful sunset before descending Number Three Gully. Anubis is a route that attracts superlatives. There is no doubt that Dave Macleod’s first winter ascent in February 2010 was visionary in concept and years ahead of its time. The route was repeated by Swiss climber Dani Arnold on his second visit to attempt the climb in March 2016. Although no stranger to Scottish mixed, Arnold is best known for setting speed records on the north faces of the Eiger and the Matterhorn, and his repeat of Anubis is undoubtedly the most difficult Scottish ascent ever achieved by an overseas visitor. Greg’s ascent of Anubis makes him the only climber to have climbed two Scottish Grade XIIs. And finally, Robbie Phillips only started serious winter climbing this season, so seconding such a climb is an achievement in itself. One can only wonder what the next chapter will hold for this extraordinary route. This entry was posted in Repeats and tagged Ben Nevis, Greg Boswell, Robbie Phillips. Bookmark the permalink.